Stylish and contemporary living awaits you in this immaculate, multi-level home defined by light-filled spaces and sweeping cathedral ceilings. This home is a true gem with plenty of space for the whole family, perfectly set in a highly-desirable neighborhood convenient to Lexington’s town center. Stylish and contemporary living awaits you in this immaculate, multi-level home defined by light-filled spaces and sweeping cathedral ceilings. This home is a true gem with plenty of space for the whole family, perfectly set in a highly-desirable neighborhood convenient to Lexington’s town center. A thoughtfully designed floor plan allows for an easy flow, perfect for both comfortable living and entertaining. The inviting front foyer welcomes you with dark marble floor tiles as the formal living room unfolds through double French doors. You’ll feel right at home in the living room relaxing by the warmth of the wood-burning fireplace with a stylish white mantel and surround. Natural light streams through the tall windows on each side of the fireplace as gleaming hardwood floors span the beautiful space. A large, cased opening flows into the formal dining room perfect for hosting special gatherings for family and friends with shining hardwood floors and a cathedral ceiling for an added feeling of expansiveness. The first of two sliding glass doors in the dining room connects with the deck and sprawling backyard, while a second slider opens to the three-season porch surrounded by walls of windows for endless natural light. Imagine summer days spent relaxing and entertaining on the porch or deck as mature trees and perennial plantings provide beauty and shade. 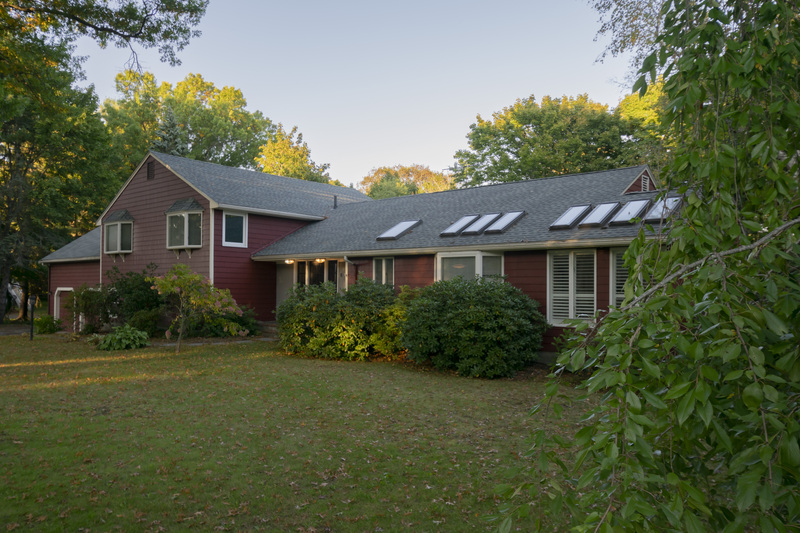 The home abuts the Vine Brook conservation area for added peace and privacy. to shine with new stainless-steel appliances, a center island, breakfast bar peninsula, stylish white cabinetry, a built-in desk area, cathedral ceiling, a large bay window, skylights, modern pendant lighting, and recessed lighting. The kitchen transitions seamlessly to the spacious informal dining area surrounded by skylights and walls of floor-to-ceiling windows overlooking the peaceful landscape. A sliding glass door from the kitchen offers another great connection to the sunny screened porch. Relax and unwind on the bedroom level with the spacious master suite, a second bedroom suite, a versatile sitting room, two more generous family bedrooms, and a family bathroom. A sunny bay window graces the sitting room with hardwood floors, recessed lighting, and a wall of double closets for additional storage. The sitting area transitions to the master suite with plush carpeting, a wall of double closets, built-in shelving, recessed lighting, and a sweeping cathedral ceiling with a fan. A sliding glass door from the master bedroom connects to a private deck offering delightful views of the tranquil landscape beyond. What a perfect place to enjoy your morning coffee surrounded by the sights and sounds of nature. The master bathroom features a dual sink vanity, spa tub, tiled shower stall, cathedral ceiling, ceramic floor tiles, and a large picture window. The second bedroom suite is perfect for guests with hardwood floors and a large double closet. The en suite bathroom is tastefully done in neutral tones with a modern white vanity, tiled shower stall, and ceramic floor tiles. Two more family bedrooms offer large bay windows and hardwood floors. Both bedrooms have easy access to the full family bathroom with a dual sink vanity, tiled tub and shower, and ceramic floor tiles. large room perfect for use as a family room, playroom, exercise space, or whatever you may desire. The bedrooms are generously-sized with plush carpeting and large double closets for storage. The full bathroom is fresh and inviting with a tiled shower. Central air conditioning keeps the home comfortable during summer months. This immaculate home is perfectly situated on a low-traffic street within a close-knit neighborhood offering a strong community feel. The town center and Minuteman Bike Path are only a short distance away. Lace up your sneakers and explore the walking trails of the abutting Lower Vine Brook conservation land. Welcome home to Lexington known for its excellent public schools, rich history, open conservation land and parks, and dynamic community life.